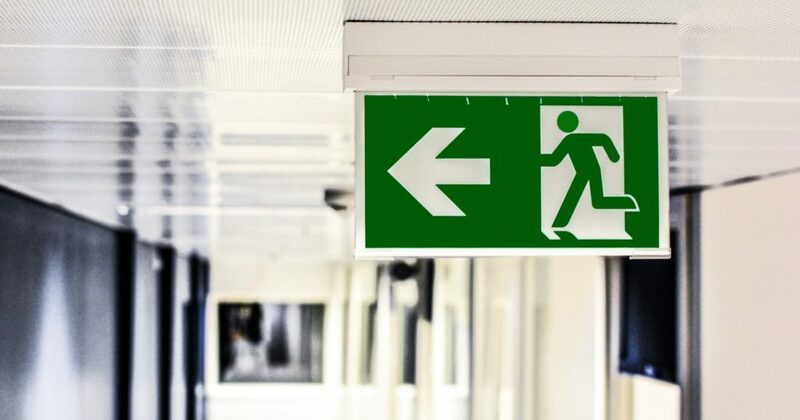 If you were faced with an emergency tomorrow and had only a few moments to leave your home, would you quickly be able to put your hands on the most important information to get you through a crisis? If your answer is no, then you need to consider putting together a Just In Case folder. 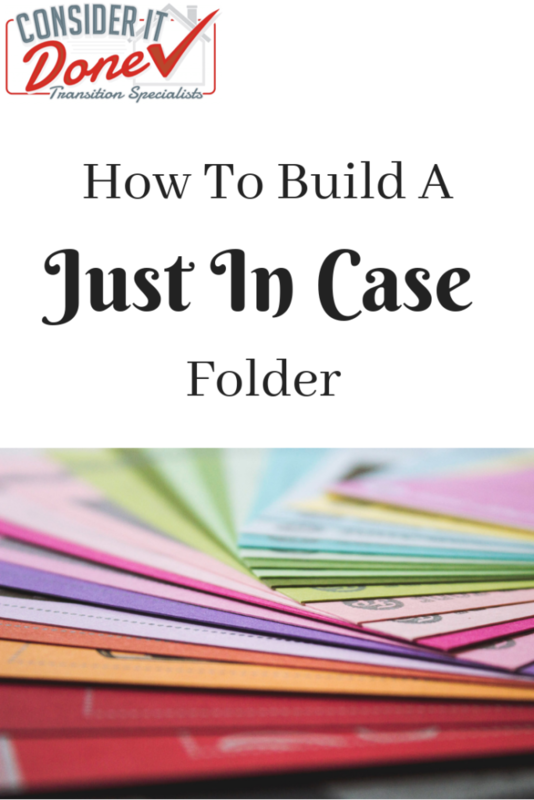 What Is A Just In Case Folder? A Just In Case folder is exactly what the name implies. It’s a folder that holds key information, just in case something happens. That could be having to leave your home in a hurry due to an emergency situation. Or it could be having the info available for loved ones in the case that something unexpected happens to you. If you have elderly parents, then this is a good topic to discuss with them too. 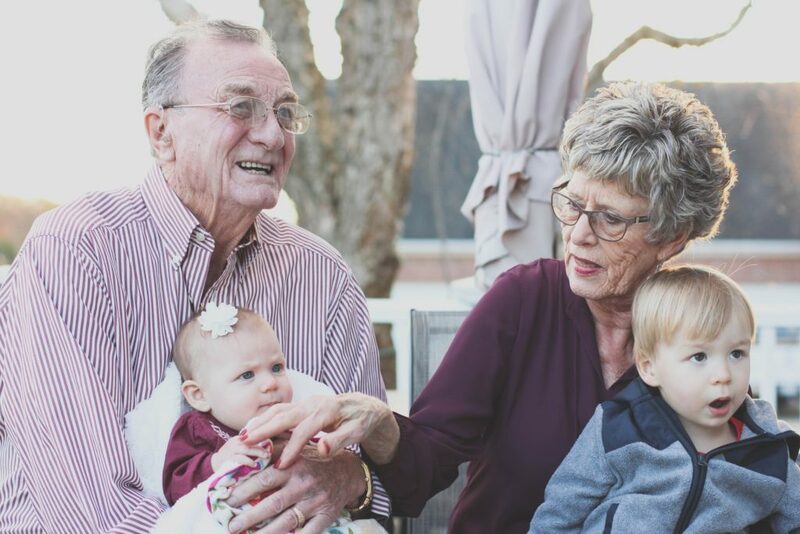 While none of us enjoy talking about death, the reality is that there are practical matters that need to be handled when a loved one passes. In a moment of distress, we don’t want to waste time or deal with the stress of finding important documents. What Goes Into a Just In Case Folder ? 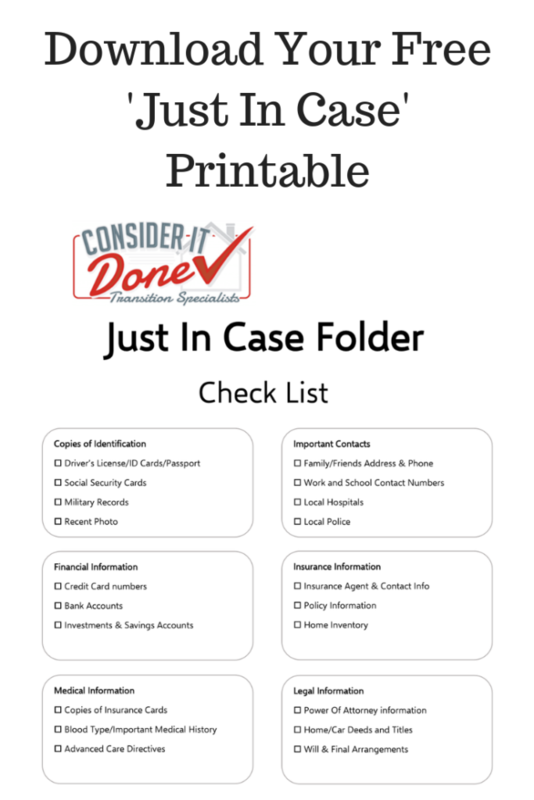 A Just In Case folder will contain copies of important documents that can prove your identity, key contacts such as your insurance agent ,a summary of financial accounts etc. Any information that would need to be accessed if the worst were to happen. If you haven’t read it yet, take a look at my ‘How To’ article on funeral pre-planning here (PrePlanning Your Funeral). Making your wishes and plans known to family and loved ones is important. 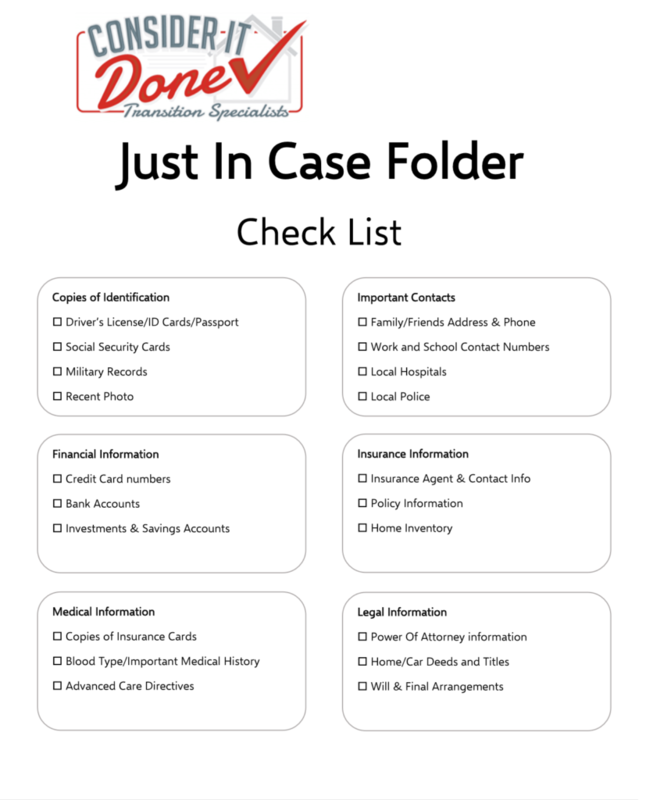 Your Just In Case folder is an ideal location to store that info. Now you may be thinking, how can I safely store this important information in a way that is both safe but easy to retrieve? My trick is to disguise the folder as something else. Perhaps put a kid’s drawing on the outer cover, or name it ‘Recipes’. 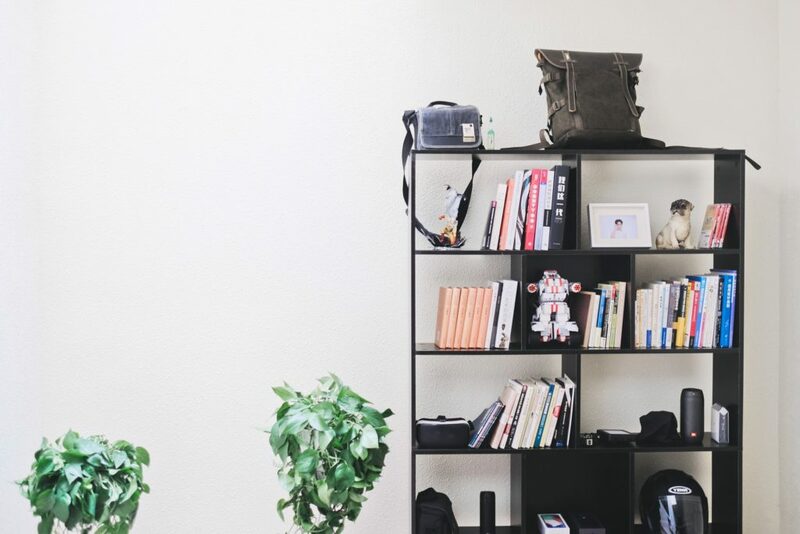 If you have a collection of books, you can store the information inside a family favorite. It should be in a location that is not obvious to anyone else, but that is easily accessible and remembered by you and your family. It should be hidden in plain sight. You should share the location of the Just In Case file with your family: spouse, parents, children or anyone else who may be involved if the unexpected were to happen. Show them were it’s located and talk them through the information that’s contained inside. Be sure the ones you trust and love know where to get these documents. To make things easier for you, I created this easy Just In Case Folder check list which will get you started on building your binder. Save this document, print it out and check off the information that you gather for your folder. Don’t forget to review your Just In Case folder once a year and make any updates that might be needed. If you have any questions about the Just In Case folder, comment below, or send me a message here! Great info Cheryl! Although we aren’t physically affected by Hurricane Michael, we are devastated by what has happened to our home away from home. I’m going to put one of these together ASAP. You just never know. Lana, I am so sorry to hear about your home. We watched that devastation with sad hearts. I am glad that you and your family are moving forward. If you need any help along the way, PLEASE let me know. You are right, you never know what life will send your way. Best to you and your family.